Thomas Caldas was born in Strasbourg, Alsace in the east of France near the border with Germany. He speaks the two languages of the region of his birth which are French and German. Thomas spent much of his childhood and part of his adult life in Ireland where he studied and was awarded a B.A. degree in languages. Thomas speaks several languages fluently including Irish and Scottish Gaelic. When he was still in Ireland Thomas joined a Druidic order. He eventually became the Ogham Master and Historian of the Ancient Order of Irish Druids. He has established branches of this order in Wales and England. Thomas has had various careers in his life. He lectured in Celtic languages and later became a blacksmith. 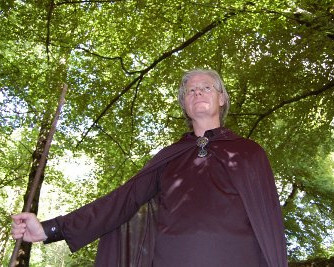 Presently he is a full-time author and tarot reader and lives near the beautiful Gower Peninsular in South Wales. 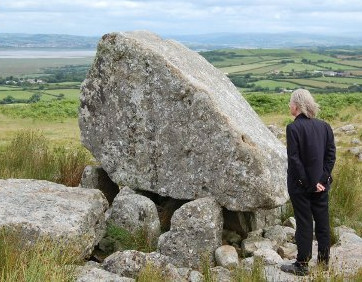 The following photo shows him at Arthur's Stone on the Gower. Peace Mala is exactly what the world needs in this time and age. Peace Mala sends out a message of peace, love and tolerance. This is especially important in a world where global warfare, racism, social injustice, exploitation, intolerance and racism have flared up again. I encourage everyone to embrace the values of Peace Mala which are indiscriminate love and compassion. Please support its work as it helps to promote love, peace and tolerance in the world.